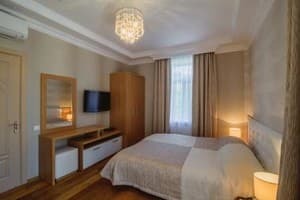 The mini-hotel of the European level "Chestnut Mansion" is located in the bedroom area of ​​the even part of the city of Yalta, away from the city noise, which allows you to create a cozy and relaxing atmosphere necessary for recreation. Three floors of the mansion house ten rooms of the class "Lux", "Junior Suite", "Standard", rooms with separate entrance "Deluxe", "Grandluxe" and "Apartments". Each room is equipped with air conditioning, LCD TV, safe. An iron and ironing board are available on request. 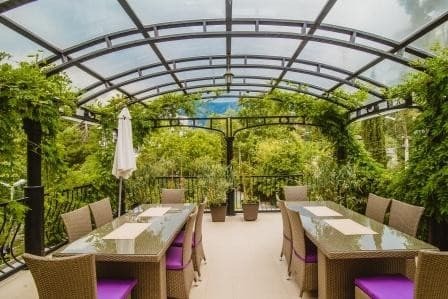 The "Chestnut Mansion" hotel is located in a closed area and includes a patio, which is surrounded by greenery all year round, an outdoor swimming pool, a garden, an open terrace overlooking the Crimean mountains. On request, guests can order breakfast, lunch or dinner from natural and fresh products. Meals are served in the dining room located on the 2nd floor. The hotel "Chestnut Mansion" operates a card key system. The distance to Yalta embankment is 1.7 km, the Yalta bus station is 4.9 km. PRICES MAY CHANGE, IT IS REQUIRED TO RECEIVE INFORMATION FROM THE OPERATOR. Description of the room: One-room area of ​​19-23 sq. M (with and without balcony). Each room has a double bed or two single beds, air conditioning, LCD TV, kitchenette (sink, electric kettle, fridge, dishes, microwave oven). Description of the room: One room (30 sq.m) with a balcony. Each room has a double bed and a single or two single beds, air conditioning, LCD TV, mini-kitchen (sink, electric kettle, refrigerator, dishes, microwave oven). 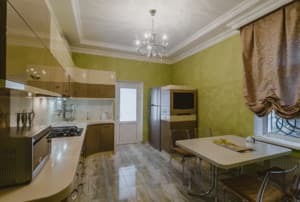 Description of the room: Comfortable one-room (41 sq.m) with a separate entrance and a full kitchen (gas cooker, oven, dishwasher). Spacious bedroom with double bed, bedside tables, closet, dressing table with mirror, LCD TV and air conditioning. Bathroom with bath, shower for intimate hygiene. 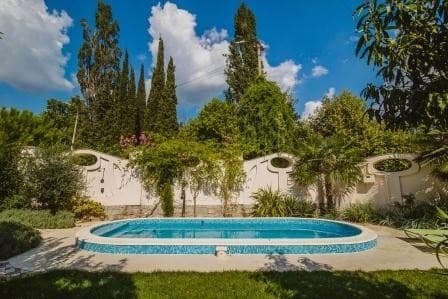 From the kitchen there is a separate exit to the pool and to the patio. Description of the room: Two-room (40 sq.m.) with a balcony. In the bedroom there is a double bed, in the living room there is a double sofa bed. The room has air conditioning, LCD TV, kitchenette (sink, electric kettle, refrigerator, dishes, microwave oven). Description of the room: A spacious three-room apartment (85 sq.m) with a separate entrance, a cozy courtyard. The spacious living room is furnished with leather armchairs and a sofa. One bedroom is equipped with a double bed, bedside tables, wardrobe. The second one - a double bed, a bedside table, a desk, a chest of drawers, a wardrobe and a universal simulator. In each room there is a TV, WI-FI, air conditioning. Bathroom with shower, shower for intimate hygiene. 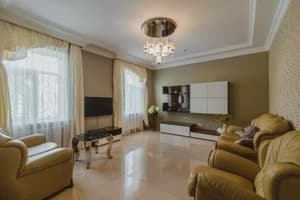 Description of the room: The luxury apartments (126 sq.m) with separate entrance and patio, include four full-sized rooms - a spacious living room, three cozy bedrooms, two bathrooms. Also in the room is a full kitchen with all necessary kitchen utensils and appliances. In each of the rooms, including the kitchen, there is air conditioning, LCD TV, WI-FI. All bedrooms are equipped with double beds, bedside tables, wardrobes. The living room is furnished with leather armchairs and a sofa. One child under 5 years stays free of charge when using existing bedding. Additional places (euro clamshells) are available on request, the cost is to be specified at the time of booking. 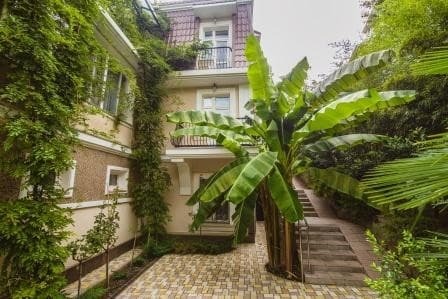 The mini-hotel of the European level "Chestnut Mansion" is located in the residential area of ​​Yalta, away from the city noise. 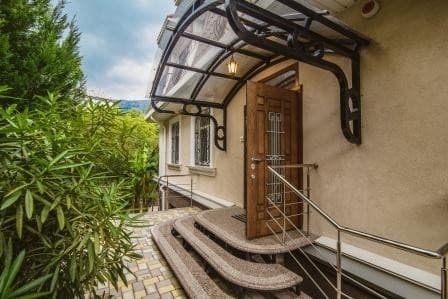 The port of Yalta is at a distance of 3 km, the Wuchang-Su waterfall is 8 km, and the Chekhov house-museum is 1 km from the hotel. To the international airport of Simferopol - 100 km, the railway station of Simferopol - 85 km, the bus station of Yalta - 4.9 km. The hotel "Chestnut Mansion" from the bus station of Yalta can be reached by bus 100, 15, 32; by route taxi 9, 22, 15a, 30, 30a. (Reference points - Krymenergo, Ambulance).